Disclaimer: everything you recognize probably belongs to the CW. Fun and fandom purposes only. Also, SPOILERS!!! 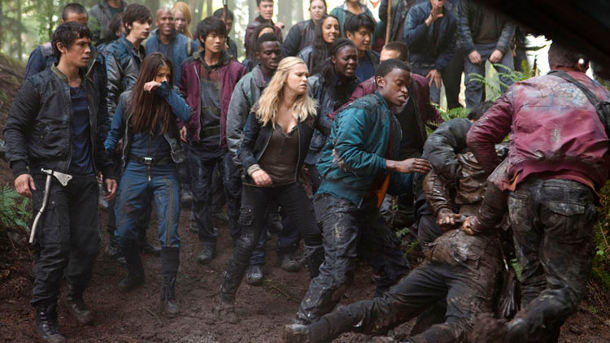 While I keep professing my love for all things YA (yeah, I even gave The Tomorrow People a chance – 45 minutes of my life lost forever), it’s no wonder I’d been looking forward to The 100 for a couple of months now, even since I first saw it on IMDB. Now, with the first season over – although at the moment of writing this I still have a couple of episodes left (thank you, my lovely eye inflammation) – I feel like something really needs to be said about this show. Like, I wish I was ten years younger to enjoy it properly. Or, I wish my YA postapocalyse (written from the ages of 12 to 16-ish) was, like, ten percent as awesome as The 100. Sure, books and screen adaptations are never the same – and I’ve yet to read the book – so bear in mind that I base my opinion solely on the cast and crew’s performance. #1 A lead who can actually act. 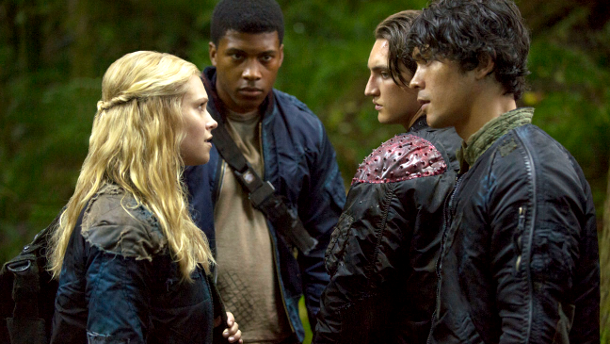 While I really liked Revolution’s Tracy Spiridakos, I admire Eliza Taylor and her Clarke. It was high time tough girls became the norm in popular YA sci-fi/F (thanks, Katniss!). Not to mention that her crying really feels like crying – some of it nearly made me cry. #2 A quality antihero (even if he turns a bit less on the “anti” side) . I hated the universe for the casting of Bellamy and Finn, because I liked Bellamy so much more, and I was certain he was in for a quick death for the annoying idiot he was. Well, guess again. And the more we dig into his past, the more I’m certain he’s a keeper. Let’s just see if the show manages to get away from Finn’s (allegedly) pretty face for more than a few seconds. #3 BSG references all around. At first it was sorta-obvious – the shooting style, the space scenes – and then there was Gaeta. Wait a second, Gaeta? Gaeta! And I may be politically incorrect, but I have a strong suspicion Raven might be a Cylon (don’t tell anyone). And yeah… when she-who-will-not-be-named came around knocking in 1×08, I was… well, a tiny bit annoyed. Typecasting much? #4 A believable insta-ship. What happened with Octavia and Atom in, like, episode number three, was one of the many reasons people call me a shipper. (I was probably the last person to know it, but yes, I am now fully able to come out as a shipper. I ship. Deal with it.) And yeah – it wasn’t that it was fast, it was also believable. And great to watch. Because that’s what affection is like – stupid and fast and hot and awkward – especially the first kiss. #5 Layered characters. The more shows you watch, the less you’re able to get surprised. With The 100, what you see at the start is definitely not what you’re going to get. Although some character developments didn’t get the screen time they deserved (especially Clarke’s mom, but also Bellamy and Kane) – after all, YA also means it’s supposed to be fast-paced – there’s still a lot of fun going on beneath the overly polished (sur)faces. I’m looking forward to seeing what else they can dig up. On the other hand, some characters are just plain old predictable… You gotta live with what you can get. But never stop expecting more. #6 Ruthlessness. It’s supposed to be a YA show, right? So where did all the throat slicing, stabbing and blowing people up come from? (And don’t tell me GoT, because I will kick you out of the library.) That, along with a couple of other things, totally took me by surprise, making me reconsider my choice in watching the show. Later I saw I was wrong – they were just going for a bit of realism, I guess. Quite refreshing. #8 A change of direction in people’s romantic interests. Sure, I might call them ships – but it’s still a bit unclear, despite the co-alpha’s continuing struggle to educate me, whether canon ships count as ships. To make things simple – it’s a multiship show. But no matter what, the main OTP (which at one moment I felt was doomed to fail, but I’m not so sure anymore) remains boring as hell. A girl can dream that one day, they will stir things up and steer interesting characters in the right direction. Just let us not discuss Octavia’s romantic interests. I’m still not really sure what to make of it all. #9 Some classic sci-fi moments. A show based (at least half of the time) on a space station, shot in the 21st century? Lovely! Especially since they’re running out of air – not arguing over the ethics of their actions, as shows from the previous century used to do. Watching The 100 feels like watching two shows simultaneously – an adrenaline-filled futuristic teen action show, and a cute BSG spinoff. Too bad for some of the predictability.